Deganawida was the peacemaker who brought the Haudenosaunee their Great Law of Peace, essentially the constitution of the Six Nations Iroqouis Confederacy. Following the 1990 Oka Crisis, Karoniaktajeh designed yet another version of the flag with both a male and female warrior entitled the “Indigenous Flag of Unity & Resistance.” Karoniaktajeh passed away in December, 1993. The Flag of the Mohawk Warrior Society was designed by the late Mohawk artist and scribe Karoniaktajeh [Louis Hall]. It was designed to serve as a symbol and standard for the Kanien’kehá:ka [Mohawk] men of the Rotinonhsón:ni Warrior Society; the vanguard of the Long House people. Originally the first flag design by Karoniaktajeh, which depicted a long-haired indigenous person, was dubbed the Indian Flag or Unity Flag. 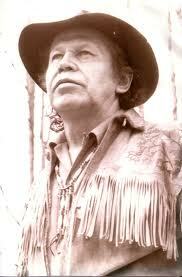 It was designed to be a prolific standard for all indigenous people to unify behind. Since one of the objectives of the Ganienkeh Indian Project was to create of venue for Indigenous Nations to gather in, the flag became known as the Ganienkeh Flag; which served as a symbol of indigenous unity, nationalism, and resistance. Later on, Karoniaktajeh incorporated the head of a Mohawk Warrior, while keeping the original designed elements. This flag was specially designed and employed for the Mohawk Warrior Society. 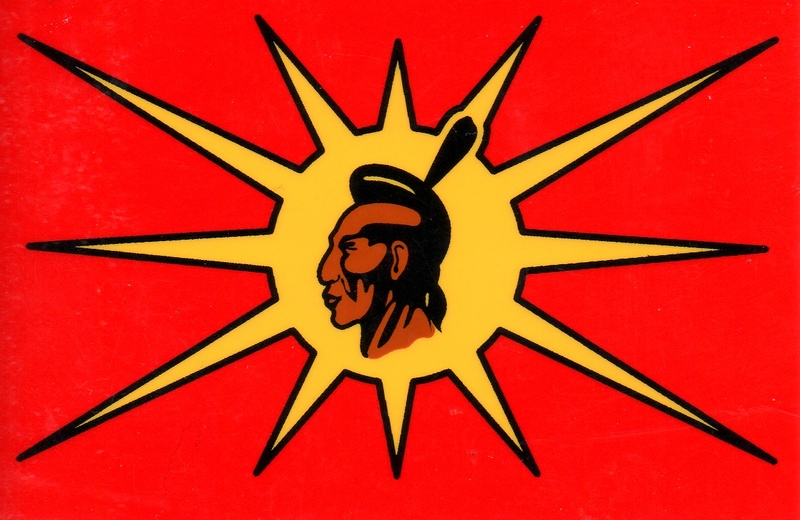 Its red background represents the Red Man, while the prolific yellow sun represents Ro’sken’rakehtekó:wa Tiohkehnéhkha Karáhkwa, our Elder Brother the Sun to which all Rotinonhsón:nimen are closely connected. The final image of a Mohawk man represents the Kanien’kehá:ka men of the Rotinonhsón:ni who are actively prepared to defend and protect its people and territory. Following the 1990 Oka Crisis, Karoniaktajeh received criticism concerning the involvement of warrior-girls within the indigenous resistance establishment and the fact that they are not represented in the flag. 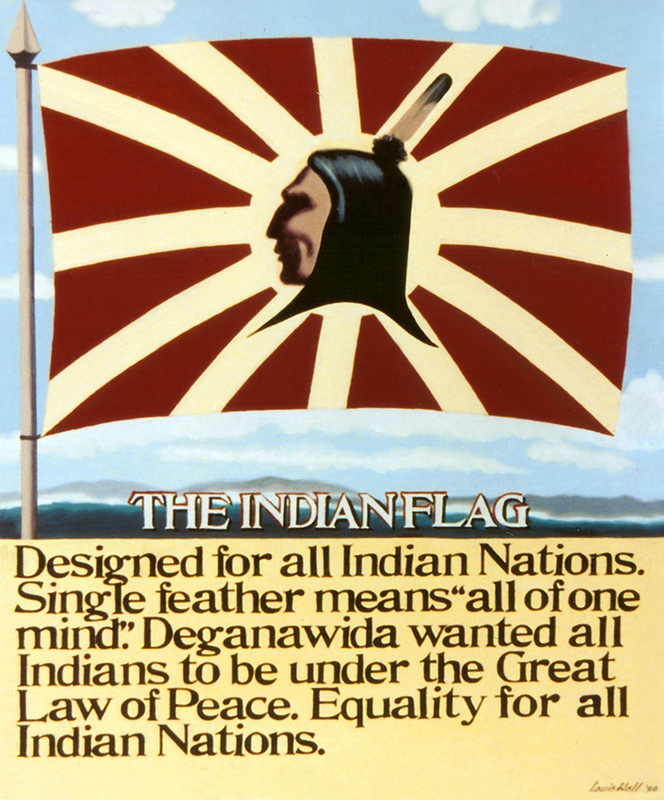 Moreover, with the mainstream-ization of the warrior flag throughout Indian Country; it became apparent that a new flag should be designed to capture the general indigenous resistance movement. Therefore, he painted a new version depicting both a long-haired indigenous man and woman. In 1997, the Kahnawake Longhouse and its Warrior Society hosted a War Dance to declare war on drugs, alcohol, and suicides in our territories. To commemorate this occasion, new flags were printed based upon Karoniaktajeh’s final design and dubbed; the Indigenous Flag and Unity and Resistance. The original painting is now on permanent displayed at the Kahnawake Longhouse. Posted on March 18, 2012, in Warrior and tagged anti-colonial resistance, Indigenous resistance, Mohawk Warrior Flag, native resistance, Unity Flag, warrior, Warrior Flag, Warrior Society, Warrior Unity Flag. Bookmark the permalink. 21 Comments. Good morning, have reviewed your manual on Colonization and Decolonization and am interested in using this for our students. How do we get approval? All materials on the site are available for download, copying, and distribution. Actually all materials, writings and painting belong to the Kahnawake Warrior Society. You do not have authority to tell people to use it at their pleasure. How do I help? Is it possible to become a member even though I have no native Indian background? I have many children and work extremely hard and have struggled for many years. My brother and I have always felt a calling of natural things and we see the destruction of this entire world coming quicker than ever before. Our eyes are open but I feel powerless. I support all native issues and believe in the protection of our morals, spirituality and our mother earth. Just looking for some direction…. thank you. Sounds like you already have more direction than a lot of people, stay the course and surely you’ll weather the coming storm. Idle no more wats your views on it? Hi warriors. I’m a Quebec Cree from the James Bay area. I wanna be a member. It does have some slight Similarities to the Japanese Imperial flag. They both have a beaming branching Sun and aimed to create one Native American Nation (All Native Nations based on Mohawk) and one Asian Nation (All Asian Countries based on Japan). Some modern Native American radicals and Asian Radicals still use both flags. I am interested in purchasing a warriors flag. Is there an on-line store or can I order one via mail? I am Native and I live in B.C Canada, how can i join or support?